Dairy farmers are getting almost twice as much money for liquid milk than they were a year ago. And while that's good news for Vermont agriculture, the memory of bad times is still vivid. "Two thousand six was the year that nobody made money," says Margaret Huessy-Laggis, a local spokesperson for the lobbying group Dairy Farmers Working Together. "Everybody was hurt; it didn't matter how big or small or where you lived." The solution, according to Huessy-Laggis, 45, of Hardwick and her cohorts, is a new plan to stabilize milk prices. The proposed addition to the federal Farm Bill would pool a fraction of farmers' profits into a fund to prepare for lean times. Huessy-Laggis is a persuasive and experienced spokesperson for the industry. Although she doesn't deal directly with chapped udders and piles of manure, she was married to a dairyman for 15 years and now makes her living as a contract lobbyist. Her lengthy resume starts with an ag degree from the University of Vermont. Huessy-Laggis worked for Senators Jeffords and Leahy in Washington "throughout the '80s" and during the 1990 reauthorization of the Farm Bill, and here in Vermont she's "done a tremendous amount of agricultural work," she says. That includes lobbying for the U.S. Smokeless Tobacco Company and groups vilified by the anti-GMO crowd, such as the Biotechnology Industry Organization and CropLife America, of which Monsanto and Syngenta are "proud members." For dairy farmers in her native Vermont, though, Huessy-Laggis is offering her persuasive skills gratis. With the legislature not in session, she's volunteering her time to speak out for the commodity milk crowd. "I have my own personal reasons for wanting to help, and I have a set of skills that I was willing to offer and that this group couldn't have afforded," she explains. Why aren't the farmers doing all the talking themselves? "They're much more articulate than I am," she suggests diplomatically, "but much more nervous [around the media]." 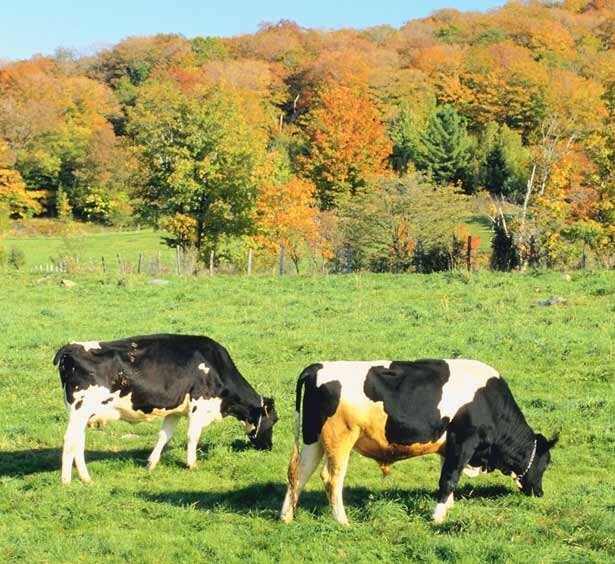 Last October, Huessy-Laggis was invited to the first meeting of Dairy Farmers Working Together (DFWT), which included farmers from Vermont, New York and New Hampshire. The gathering was prompted by intense frustration over the low prices of 2006, she says. That year, the price of milk dipped to about $11 per hundred pounds, or "hundredweight." (This year, it's up to around $20.) Caused by a surplus of merely 4 percent, the price drop affected farmers across the board, Huessy-Laggis says: "It's the first time that everybody said, 'I don't want to visit this nasty train station again.'" Without seeing "anything on the horizon that was going to help them," members of the DFWT decided to step up and offer their own solution. "The people that were meeting aren't on the boards of any co-ops," says Huessy-Laggis, referring to cooperative associations of dairies. "They hadn't been tainted by 25 years of being unable to get a coalition together nationally. They didn't have any of that baggage, just had the feeling that we want to try for something better." Their proposed solution is a regulation mandating that dairy farmers put 13 cents per hundredweight of milk they sell in a fund. That fund would be used to hire expert economic analysts and marketers who would forecast the fluctuations in the milk market for 12 to 18 months in the future, then work with farmers to manage the milk supply and with consumers to encourage consumption. Although the plan wouldn't guarantee farmers a profit, Huessy-Laggis says, it would "help stabilize the price of milk so farmers could do some long-range planning." She points out that even "a tiny little surplus can cause a drop in prices paid to farmers," as in 2006. Right now, an organization called Cooperatives Working Together (CWT) does something similar on a voluntary basis, although it only collects 10 cents per hundredweight of milk sold. "Voluntarily, we haven't gotten enough money from people to make CWT work," Huessy-Laggis claims. "Only 67 percent of milk is covered. It hasn't been a steady, successful participation program." Under the new plan, farmers would no longer need to contribute to CWT, and their dime would go toward the 13 cents paid into the new pool. Most interested parties agree that the pricing problem needs a holistic solution, but bringing farmers nationwide to consensus is no picnic. "The dairy industry is made up of very independent people, so it's been hard to come up with a nationally unifying kind of plan. It's been very regionalized," Huessy-Laggis says. But with public support from dairying groups in California, Florida and other states, she feels the group has a good chance of getting its proposal on the Farm Bill. "This is the only idea out there; there is nothing else," she insists. "If dairy farmers want a change, they're kind of in a position to work with us and make the plan the best it can be, or they can stick with the status quo." While awaiting the outcome of the Farm Bill, what can local government do to help dairy farmers? In Huessy-Laggis' mind, not much. She explains that, because most of our fluid milk is purchased by out-of-state entities, our own government "has little control. We're the number- one exporter of dairy products per capita," she continues. "In Maine, they consume almost everything they produce in the state. We [Vermonters] consume less than 10 percent of the milk produced in Vermont." With a small population and a large number of dairy farmers per capita, Vermont also can't collect enough tax dollars to bolster the farmers when times are rough. Huessy-Laggis suggests some ways to stabilize the price of milk over the long term might be to "retire herds of cows or expand overseas markets" - China, for instance, "looks like this huge empty pit of opportunity for dairy products," she says. She's not so optimistic about the potential of companies that make value-added products with Vermont milk, such as the Vermont Milk Company and the Kehler brothers of Jasper Hill Farm. While Huessy-Laggis appreciates such efforts, she says, their milk usage isn't high enough to make a real difference. "They're great additions, but they're not going to be the bedrock of the community," she opines. "We'll always depend on milk as a commodity."